Rum (English: Verdict) is a 2017 Indian Tamil-language horror heist thriller film written and directed by Sai Bharath. Featuring Hrishikesh, Narain, Sanchita Shetty and Miya George in the lead roles, the film’s score and soundtrack is composed by Anirudh Ravichander. The film began production during early 2016 and was released on 17 February 2017. 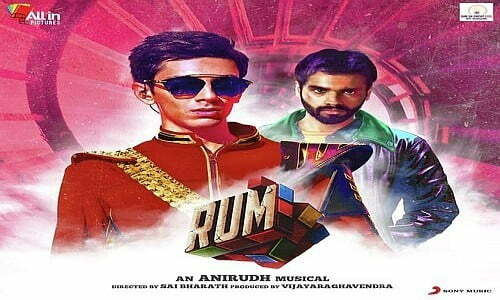 The film began pre-production works during October 2015, with composer Anirudh Ravichander revealing that he would work on a film titled Rum directed by Sai Bharath and starring his cousin, Hrishikesh, in the lead role. The project was announced to be funded by All in Pictures, while the director stated that it would be a “horror-heist film”. After completing a course in filmmaking in Canada, Sai Bharath had finished the script three years prior to the beginning of the shoot. He had approached Hrishikesh, who was looking to appear in his first lead role, after playing a supporting role in Velaiilla Pattadhari (2014). In February 2016, the film’s first look poster was unveiled, with Sanchita Shetty and Miya George revealed as the film’s lead actresses. Narain, Vivek and Amzath Khan were also announced to be playing supporting roles in the film. The title Rum was revealed by the makers to be an ancient Tamil word meaning “verdict”, rather than the alcohol as widely presumed. The shoot of the film began in February 2016 in Chennai and was finished by June 2016. During May 2016, the team shot for a fast-paced gaana song titled “Peiyo Phobilia” in a dense forest in Padappai and set up a campsite on location. The final schedule for the film began on 1 June 2016 and carried on for fifteen days until completion.